A lost jungle kingdom where animals are in charge is the setting for Jungle Giants, a 5 reel, 50 payline video slot from Playtech. Boasting superb design, it comes with giant 3×3 symbols and a bonus round that awards unlimited free spins with the lower value symbols removed from play. Stakes start at 50p per spin. Playtech’s designers have created a cracking looking game here. A lost jungle civilisation is the setting with the reels are flanked by elephant monoliths. You’ll see stone age-style A to 10 playing cards spinning around the reels alongside a selection of wilds animals. The oxen and hippos pay up to 50x your time per payline followed by the gorillas which award up to 75x and the rhinos which offer up to 100x. King of this particular jungle is the mighty elephant who’ll get you an award of 30, 75 or 150 times your stake if you land 3, 4 or 5 in combination. All of the animal symbols can land in giant 3×3 formations on the middle 3 reels to really boost your winning chances. The wild can land in a 3×3 stack too – it substitutes for all other symbols bar the Jungle Giants logo and offers awards of up to 1,000 times your stake per payline! Jungle Giants comes with a Giant Free Games feature but it has the potential to be a cracker – to trigger it, you’ll need to land the giant Jungle Giants logo fully on the middle 3 reels. You’ll then receive 8 free spins. All of the lower value playing card symbols are removed from play during the feature. More importantly, the middle 3 reels are made up entirely of giant 3×3 symbols throughout the feature. Also coming into play here are stacked symbols on reels 1 and 5. Needless to say, if you land matching stacks on reels 1 and 5 with a fully formed giant symbol on the middle reels some mouth-watering wins are possible. Re-triggers are possible here too with unlimited free spins on offer. 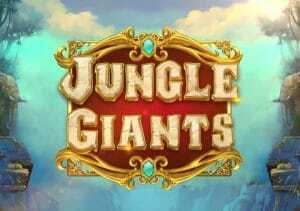 Jungle Giants is a pretty simple video slot as far as gameplay is concerned. The best action comes via the free spins round where the giant and stacked symbols can unite to spectacular effect. Combined with the design, which is as good as you’ll see anywhere, it makes Jungle Giants an entertaining and very playable overall package. If you like the jungle theme, there are plenty of options with Microgaming’s Jungle Jim El Dorado a good choice.